I knew this was my kind of book when on the very first page the author states, "There's a science to seed keeping, but I'm a laid-back kind of gardener who doesn't stress over it." This is a cozy, curl up in a chair type of gardening book. The kind you read in the middle of winter (like I did today.) and dream about spring and getting your hands in the dirt. I learned about the things I did last year in preparing my soil. It's a positive book though and I never once felt stupid like I do a lot of times when reading gardening books or magazines written by "experts". Now I have a list of 6 things I can do to prevent pests and disease, all natural, no chemicals. Hurry up Spring! After reading Lynn's book, I only wish I had seeds from my grandmother's rose garden. Her roses were her hobby and they were a glorious sight to behold. Their fragrance filled the air in her backyard and drifted in the breeze. Mostly, they made the washing and drying of her dishes a more pleasant chore as there were always a rose or two in a pretty vase by her kitchen sink. Oh, and how I wish I'd kept seeds from the small weekend farm she and my grandfather owned. The vegetables were wonderful in their various shapes and colors and their fruit trees yielded the most wonderful treats. Lynn's book brought all of that back to me. She is an awesome writer and her book is full of hidden gems! This book was unexpectedly delightful to read. I thought it would just be a dull educational guide, but I'm curious about heirloom plants so I picked it up anyway. It's actually quite interesting, not just telling about growing the plants but telling about the origins and history of certain plant varieties. To me that's fascinating, the people who grew these plants and the stories they carry with them. This book captured that growing certain plants isn't just about taste, sometimes it's about a sense of history or connection to your family. You might grow a certain tomato because it's what your grandma grew and that means something to you. That's kind of wonderful.I grow very few plants from seeds. I tried...and failed pretty epically last year at the seed starting. But really, I loved reading this book. It's got delightful little stories but also practical facts about the heirloom plants it features. It's a laid back kind of book, not science heavy.Just for honesty's sake I should admit that I only read the vegetable portions of this book. I'm just not a flower growing type of girl. I grow some, but it's edible plants that I truly find fascinating. Gardening With Heirloom Seeds: Tried and True Flowers, Fruits, and Vegetables for a New Generation by Lynn Coulter (University of North Carolina Press 2006) (635) is a fun and informative read. It highlights cottage annuals and old fashioned vegetable varieties that have grown out of fashion. My rating: 6.5/10, finished 4/13/12. This is an excellent resource for any gardener who is interested in growing from heirloom seeds, saving seats, and preserving the heritage of our plants. This book covers growing flowers, vegetables, and herbs. A good book to browse through for ideas on specific varieties to grow. Helpful suggestions for planting, harvesting, and eating, specific to individual heirloom varieties. A useful, well-organized overview, clearly written. 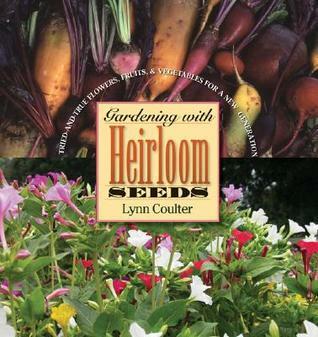 Lynn Coulter - I'm the author of 3 books (Gardening with Heirloom Seeds, Little Mercies and Mustard Seeds) and a freelance writer for the HGTV, Travel Channel and DIY Network websites. I'm also a wife, mom and the pet parent of two rescue pups.